What is the Best Month to Buy Park City Homes? 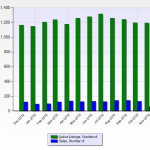 This chart shows the number of active single family listings vs. the number of sales. Source: Park City Multiple Listing Service. Note, this chart was printed on 11/14/15 and does not reflect a 30-day month. A picture is worth a 1,000 words. The fewest sales related to available inventory occur in the month of November.